Craig Cathcart competing against Estonia. Pic by PressEye Ltd.
Northern Ireland defender Craig Cathcart was a happy man after their 2-0 victory against Estonia at the National Stadium at Windsor Park. Second-half goals from Niall McGinn and skipper Steven Davis sealed the win for Michael O’Neill’s men. It was also a good performance from the home side as they won their opening qualifying game for the EURO 2020 finals before taking on Belarus on Sunday. Watford defender Cathcart was excellent in defence with Jonny Evans, Jamal Lewis and Stuart Dallas. And Cathcart says they are glad to get their campaign up and running before Sunday’s second group game. “We knew it would be a difficult game and Estonia came here and sat back in the first half and made it difficult for us as they defended very well. “They were very hard to break down as they were well organised. O’Neill’s men had plenty of chances in the first half with McGinn and Paddy McNair both coming very close to opening the home side’s account. How McNair missed his header from five yards is anyone’s guess - but Cathcart was glad to see the first goal go in after the goal-scoring frustrations they had during their disappointing Nations League. “We knew the first goal was vital so it was nice to see it arriving,” he said. “We were pushing in the second half to get the opener and I was relieved to see it go in. Also last night in Northern Ireland’s group the Netherlands saw off Belarus by 4-0. The Dutch and Germany are the main threats in the group and Northern Ireland will meet them later this year after their four games against Estonia and Belarus. 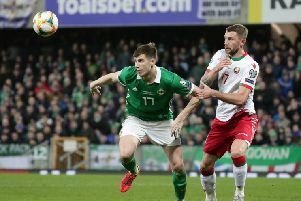 Belarus are next up for Northern Ireland at the National Stadium at Windsor Park on Sunday night and Cathcart believes another victory over the weekend is vital to keep them on track. “We want to keep the momentum going on Sunday evening,” said the defender. “We will prepare well for the match and we will go into the game looking to put another performance on the board and get another positive result. “We need to be winning these games.